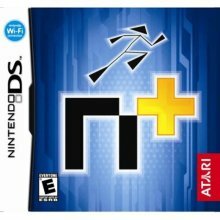 Originally a free flash game by Metanet Software, N+ has gone a long way and is now enjoyed in the Nintendo DS. To the naked eye N+ has nothing to offer. Except for running and jumping, your ninja character can not do anything. Despite being a ninja, you are not armed with a knife, no ninja stars to throw, and no ninjutsu to use. There are only 2D platforms and all you need to do is get to the exit. Anything that you think might hurt you will kill you instantly. This is one of the benchmarks of the game. A single mistake means you have to start all over again, making N+ quite challenging. There are a lot of obstacles and hindrances around the levels like, mines, fire, laser, missiles, and a lot more. Again, these things will kill you instantly. Even falling from a considerable height will kill you instantly. You need to put your brain to the test and think creatively to avoid all these obstacles. There are a lot of them. Usually switches play a big role and you some switches, when opening paths, also close other paths. This means you have to plan carefully where to pass and which switches to flip. The more switches that come into play the more complex the level becomes. There is a time limit for every level, collecting gold as you move along. So collecting gold is a good thing, unless it is located in a dangerous place. A feature included is the ability to make your level. Now you can make an insanely difficult map and challenge a friend to finish it. Or your friend can make a map for you and challenge you to finish it. N+ is surprisingly addictive. Even with its simple design, the challenge and fun outweighs by far the simplicity of its design.